Greetings again from the darkness. Is it too good to be true? 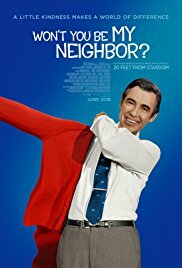 We often ask that question in life, but when it comes to Fred Rogers of “Mr. Rogers’ Neighborhood”, director Morgan Neville’s documentary proves the answer is no … he was good and true. Fred Rogers hosted the children’s TV show on PBS for more than 30 years, starting in 1968. The terrific (and surprisingly emotional) film provides the background of the show, and more importantly, profiles a wonderful man. Director Neville (BEST OF ENEMIES: BUCKLEY VS VIDAL, 2015) has produced numerous biopics on musicians ranging from Keith Richards to Muddy Waters to Johnny Cash to Brian Wilson. His subject this time out was known for his singing the show’s familiar opening number, and his lyrical legacy was his substantial impact on many generations of children. Mr. Rogers was an ordained minister and, in the early days of television, recognized that violent cartoons were not appropriate programming for the formative childhood years. Even in the early years, he was an outlier with sincerity and wholesomeness in entertainment. He never shied away from tough topics – not even death – whether it was the assassination of Robert Kennedy or a dead fish in the aquarium on set. He spoke directly to children in a voice and language they understood. There are interviews with fellow cast members, long timer crew members, and relatives, including his wife Joanne. We hear Francois Clemmons (Officer Clemmons on the show) discuss how Mr. Rogers addressed Clemmons’ homosexuality and race, adding poignancy to the shared televised foot bath. Archival footage takes us back to the early years, and we see Lady Aberlin and Daniel Tiger in both black and white and color segments. We learn that the puppet Daniel most resembled the personality of the host himself … a quiet, patient, compassionate being who cared about others. We see footage of Fred Rogers testifying in front of a Senate sub-committee to prevent funding for PBS from being eliminated, and we see numerous cardigan sweaters and tennis shoes. Mostly we see the approach of a man who built a legacy on kindness and human decency … a lifetime pursuit of uniting that led to struggles with depression. His obsession with 143 – both his weight and his code for “I love you” provides some insight into his personality, and mostly we hear others speak of his lasting impact. Rather than comedy and pranks, Mr. Rogers was intent on making kids feel safe and secure in a scary world. Sure he educated – often subtly – but it was his innate ability to comfort that kept kids coming back. There are naysayers who say he is responsible for generations of entitled kids who grew into entitled adults, but the film addresses this by showing Roger’s commencement address where he clearly explains the “special” label. His final show was in 2000 and he died in 2003. His legacy is simple yet powerful. We can each do better. We can each be better. We can each be better neighbors. This entry was posted on Friday, June 8th, 2018 at 6:32 am and is filed under Documentary. You can follow any responses to this entry through the RSS 2.0 feed. You can leave a response, or trackback from your own site.